SAM (Società Automobili Motori) was an Italian automotive manufacturer based in Milan with operations in 1924 through 1928. The company built a number of cars with 882 cc, 1000 cc and 1098 cc engines. 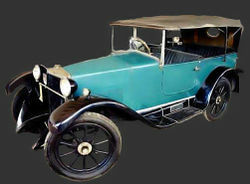 Unfortunately, these vehicles could not prevail against the competition and had to closed it doors in 1928.